JAKBOPEE Sports Category candidates in CET (Engineering), 2018. (i) Letter No. SC/491-CET/331 -34 Dated 08-05-2018. (ii) Notification No. 037-BOPEE of 2018 Dated 15-05-2018. It is hereby notified for the information of all candidates, who have appeared in CET (Engineering) 2018 and whose result have been declared vide Notification No. 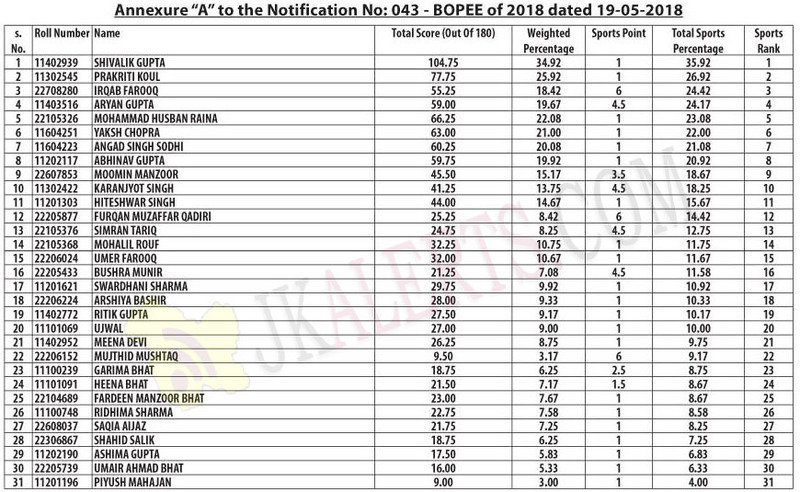 037-BOPEE of 2018 Dated 15-05-2018 that the J&K State Sports Council has provided the list of candidates to whom the sports points have been awarded. The Board has accordingly prepared a list of sports category eligible candidates on the basis of sports rank as prepared in accordance with the rules is annexed as Annexure’W’to this Notification. Further, any candidate desirous of making representation(s) against rank assigned to him or to other candidates, if he/she may chooses to make a representation to the BOPEE office at Jammu/Srinagar up to 22-05-2018 (5.00PM) or submit the same online at [email protected] along with documentary evidence in support of his/ her claim.